For several seasons women’s shoes have been sprouting hair in a variety of shades, textures, lengths and styles, both real and fabulously faux. 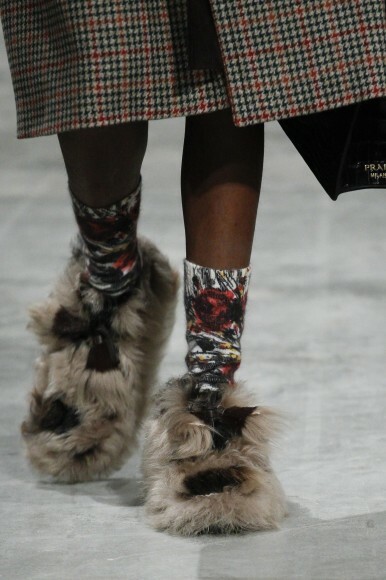 Brands as disparate as Gucci, Comme des Garcons, Undercover, Maison Margiela and Avec Moderation are just some of the more noticeable names to take part in the fuzzy foot trend. However this penchant for furry footwear began, it shows no sign of slowing down. Yesterday at the Prada Men’s Fall 2017 show in Milan, amidst Miuccia’s 70′s-centric soiree of corduroy, leather, and every shade of brown known to man, a lovely group of Prada ladies joined the fellows with coordinating looks that brought the reverie to this decade full circle. 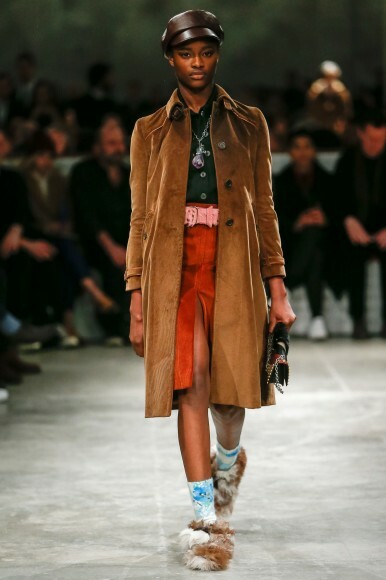 Texture reigned from head to toe for both boys and girls. You can practically feel the fabrics right through the photos. Lush and expensive looking, Prada never skimps on the details, even if the main event somehow feels ever so mellow-yellow. Among the many interesting non-sequiturial accessory ideas to appear in the collection was Prada’s version of the Muppet Shoe. 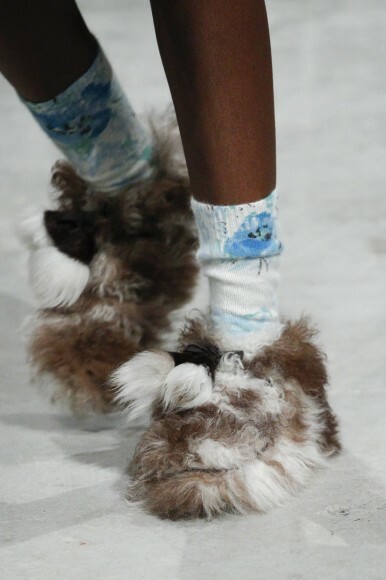 These shaggy-licious chaussures are perhaps the hairiest, fluffiest beasts to embrace a human foot since the dawn of the caveman. It’ll take a brave sole to hit the city streets in these furry monsters, but for those who do, they’ll surely have the toastiest tootsies in town. They’re so quirky I actually like them! !